From the Book: The first make-or-break step in persuading anyone to do any thing is getting them to hear you out. Whether the person is a harried colleague, a stressed-out client, or an insecure spouse, things will go from bad to worse if you can’t break through emotional barricades. 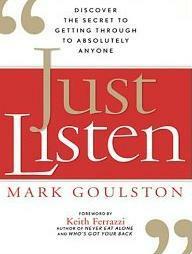 Drawing on his experience as a psychiatrist, business consultant, and coach, and backed by the latest scientific research, author Mark Goulston shares simple but power ful techniques readers can use to really get through to people–whether they’re coworkers, friends, strangers, or enemies. Getting through is a fine art but a critical one. With the help of this groundbreaking book readers will be able to turn the “impossible” and “unreachable” people in their lives into allies, devoted customers, loyal colleagues, and lifetime friends. From the Book: Why are some people and organizations more innovative, more influential, and more profitable than others? Why do some command greater loyalty? In studying the leaders who’ve had the greatest influence in the world, Simon Sinek discovered that they all think, act, and communicate in the exact same way-and it’s the complete opposite of what everyone else does. 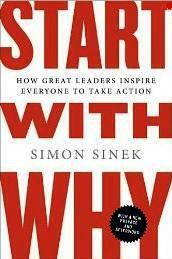 People like Martin Luther King Jr., Steve Jobs, and the Wright Brothers might have little in common, but they all started with why. Drawing on a wide range of real-life stories, Sinek weaves together a clear vision of what it truly takes to lead and inspire.